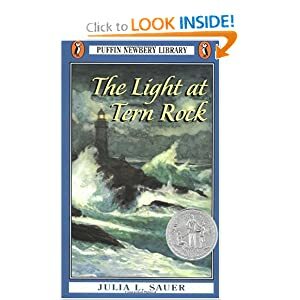 Sauer, Julia L. The Light at Tern Rock (published in 1951 by The Viking Press; republished in 1994 by Puffin Books, a division of Penguin Books USA Inc., 375 Hudson St., New York City, NY 10014). How would you feel if you were stranded in a lighthouse on an island—and it’s almost Christmas? It is about a month before Christmas, and the lighthouse keeper at Tern Rock, Byron Flagg, asks the widow of his predecessor, Martha Morse, and her eleven-year-old nephew Ronnie, if they would watch the lighthouse for two weeks so that he could take a much needed vacation. Aunt Martha hesitates, but Flagg emphasizes how much fun it would be for Ronnie. They finally agree if he promises to come and relieve them by December 15. While at the lighthouse, Ronnie learns how to clean the lantern, polish the lens, wind the mechanism that turns the lamp, pump oil into the chamber, and other routine tasks. However, December 15 arrives, and Mr. Flagg doesn’t come. And he doesn’t come. And he doesn’t come. Suddenly, it’s Christmas Eve. Will they end up having to spend Christmas on Tern Rock after all? This book was a Newbery Honor Book in 1952. It’s a touching story which serves as a great reminder about the need for forgiveness and what’s really important in life. Yes, Ronnie’s mood sours and seeds of bitterness spring up in his heart, but there’s a surprise that changes his thinking and brings him newfound joy. The euphemism “gee” is used once. Those who do not observe Christmas as a religious holy day will want to know that there is reference relating the celebration to the birth of Christ. Julia Sauer’s Fog Magic was a Newbery Honor Book in 1944. This entry was posted in general youth fiction, Newbery Honor Books. Bookmark the permalink.